These systems all come complete with a LIFETIME GUARANTEE and in the event of a repair the turnaround time is exceptionally rapid. Please specify 173Mhz, 216Mhz or 433Mhz frequency in the comments section of the order form. Legal frequencies in the UK are 173 and 433Mhz. These systems all come complete with a 3 YEAR GUARANTEE and in the event of a repair the turnaround time is exceptionally rapid. These systems all come complete with a 3 YEAR GUARANTEE and, in the event of a repair the turnaround time is exceptionally rapid. Postage on this item is £10.00. Brand new on the market - The Desert Ranger is available in 10 or 16 channel thus allowing the user to programme fequencies as required. Programming is carried out by means of a notebook computer running Linux operating system and software. Available only on 433MHz at present but 173, 216 and 169 coming soon. 25mw Standard power � operates using two batteries. Weight 9.5gm. Length 305mm. Battery duration 5 days continuous. 50mw High power � uses 1 x N1/3 battery. Weight 12gm. Length 300mm. Battery duration 16 days continuous. Replacement transmitters can be supplied for virtually any telemetry system on any frequency. PLEASE NOTE: Transmitters supplied will be for Black Falcon systems. If you are purchasing for any other system please make this clear in the comments section of the ordering process. I will need to know the maker of the telemetry system and the exact frequency that you require. Enlarge Photograph Merlin � operates using single battery. Weight 3.2 grammes. Length 193mm o/a. Battery duration 3.5 days continuous. 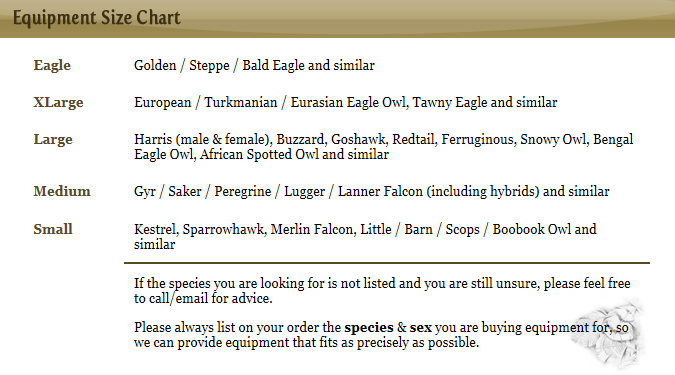 For Black Falcon transmitters only. ����IMPORTANT���-���Please state transmitter frequency and power rating (standard�or high power) in comments section of order form. 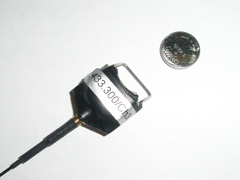 This is�to ensure that�the correct�aerial is supplied for your system. Available in 173MHz, 216MHz and 433MHz. You want to leg mount (this is starting to sound sordid!) your telemetry transmitter? You're fed up with attaching it by cable tie and then cutting it off again later? This is your saving grace. 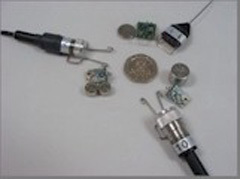 Attach the transmitter permanently to the toggle loop and put the bullet through the anklet eyelet. Job done! Do you have a miserable sod for a neighbour? Do the words "Can't you shut those bloody bells up?" sound familiar? These bullet toggles can also be used with bells so that they can be removed when your bird is in the aviary and the miserable git next door is in his garden. Are we good to you people or what? PS. 4 sizes available. Sizes shown relate to the anklet eyelet size. PS. 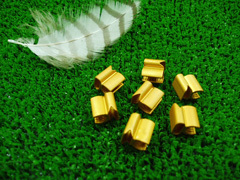 These are now made from Delrin - a product that fills the gap betweem plastic and metal. It is very tough and VERY strong. We no longer fit sliders to this item as the birds just found them great fun to peck at and destroy! 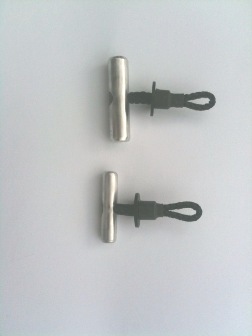 4 sizes available and size of toggle relates to size of anklet eyelet. We have a large collection of batteries available for transmitters, ferret finders etc. If you are unsure which battery you require for the system/piece of equipment you have, try using a magnifying glass cos it's written on the battery somewhere! Sturdy canvas carrying case with half length zip, fleece lining, internal transmitter pocket and adjustable carrying strap. Available in two lengths for fixed and telescopic aerials. 17" and 29"
Exactly what it says...........a battery tester. An essential piece of kit that can be kept in your hawking bag or in the car so that you are always able to check the battery condition of your telemetry transmitters and receiver. Many other uses around the home too! Aluminium. lightweight single tail mounts, exactly the same as Marshall......just much, much cheaper! Closing pliers for this item are shown below. Tail mount pliers to close the above tail mounts. These are not required for use with the brass tube tail mounts. 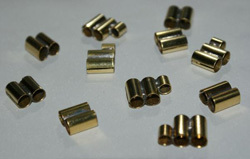 Brass tube tail mounts. Probably the most discreet of all tail mounts and weighing in at only 1.5 grammes! Our double tail mount is believed to be the only double tail mount available on the market today and can be used to mount bell and telemetry together on one deck feather and therefore not locking the two deck feathers together thus allowing for correct freedom of movement. Proven over many years of use. Made from spring steel (is that different to winter steel....) these transmitter clips are exclusively for use with Black Falcon transmitters. Complete with shrink sleeving.